At least four students have been tased by police officers just over a month into the school year, adding their cases to some worrisome statistics: Since 2011, nearly 100 US children have been tased by school-based officers. An electroshock weapon was last used on a 15-year old student at Middleton High School in Wisconsin on September 22. The teenager reportedly spotted people he knew trying to enter the school during lunch time. He became agitated and got into a fight with the group, with whom he’d previously had problems. Police tried to break up the fight and at one point, one of the officers shocked the 15-year-old with a Taser. Weeks before that case, a school-based police officer tased two female students when deputies at a Florida high school tried to break up a fight. The brawl at Leesburg High School was was captured on video. It shows the officers trying to unsuccessfully separate the girls. One of the officers can then be seen pulling out a taser, because it was “the safest way” to stop the fight, the sheriff's office later said. One girl was taken to Leesburg Regional Medical Center because a stun gun probe became caught in her bra under her arm and could not be removed by officers. Mere days before that, a Taser was used on a North Carolina student on August, 29, who was reportedly blocking a door at E.E. Smith High School in Fayetteville. 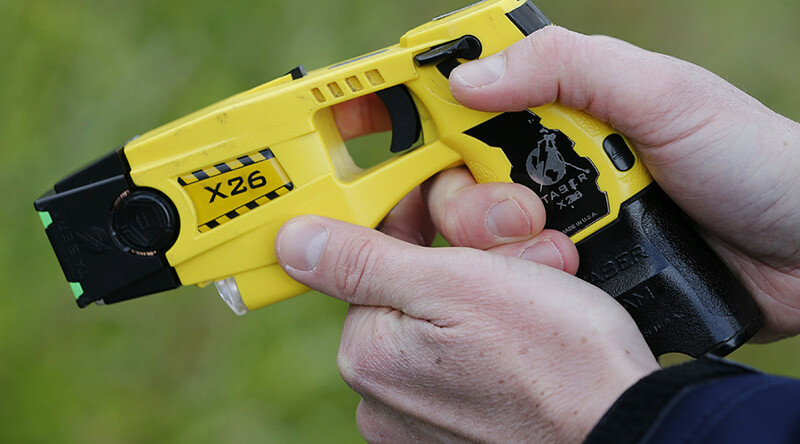 A school resource officer tased the 18-year old student after trying to arrest him. These four most recent cases add to the 84 times since 2011 that schoolchildren have been struck by electroshock weapons, sometimes resulting in bad injuries, according to an investigation by the Huffington Post. — RT (@RT_com) 11 сентября 2016 г. One of the examples of devastating physical harm a Taser can cause was Texas high school student Noe Nino de Rivera. He was stunned at school after trying to break up a fight, fell to the ground and hit his head. He spent nearly two months in a medically induced coma. “The children, who were all hit by a Taser or stun gun by school-based police officers, also called school resource officers, were 12 to 19 years old when the incidents occurred,” according to the “Set to stun”report by the Huffington Post and the Hechinger Report, released in August. As the report notes, the number of cases they managed to track down is still largely underestimated, since because not every incident is reported, and no state or federal organization keeps track of the problem.